The heat-cleaning ovens are used in various industries. Most coaters will agree that cleaning these systems is one of the major problems. Although they are using various cleaning procedures to clean them, still contamination, safety, and overspray are major concerns among them. Thus, the coaters are opting for burn-off ovens, which enable easy cleaning with no pollution, or hazardous byproducts. The Armature Coil (ACE) burn-off oven models help coaters to overcome challenges associated with traditional heat-cleaning ovens. These ovens enable them to gain advantages in the form of quick turnaround times, efficient energy use, and minimal labor. The following are some beneficial features of our burn-off ovens, which have contributed to their easy acceptance among coaters. Construction: We understand that the ovens are required to withstand abuse. The high temperature (800ºF) combined with possible inclusion of acids, and humidity, leads to corrosion. Thus, our coating ovens have a heavy-duty construction, and feature an enclosure, which is made of 11-gauge steel, and coated with high-temperature resistant coating. The burn-off oven has a well-built design, which helps reduce repairs and maintenance, as well as extends their service life. Insulation Systems: The insulation system on the ACE ovens offer excellent heat efficiency. Insulation system is rated 2,300ºF for the main chamber, as well as 2700ºF for the exhaust stack. There is a retort featuring heat resistant, stainless steel tube. There is an internal flight within this tube, which eases the movement of the material from the in-feed zone to the out-feed zone. 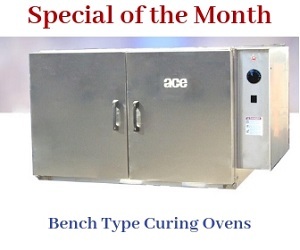 Heating Sources: The ACE burn-off ovens are empowered with radiant tube technology. Most ovens feature a primary chamber, main chamber, and an afterburner. Stripping of load takes place in the primary chamber, and heat enters into the main chamber. The afterburner is the area, where the combustion of gases take place. However, in our models, there is no main burner box. This means there is no wastage of energy, as no heat is used to heat the box. Also, the radiant heat technology enables uniform heat distribution with no hot or cold spots. One Touch Control (OTC): Controls are one of the important features of the burn-off ovens. Our ovens are equipped with a self-adjusting control system. This system closely monitors the burn off of the product, and make self-adjustments to prevent any type of load overheating. There are sensors in the oven that help determine the particular temperature at which the burn off should continue. Exhaust Stack and Accessories: In the burn-off oven, the heat is exhausted from the afterburner. Stack is one of the important features of these ovens, which helps in exhaustion. We offer stack sections in various lengths, with insulation sleeves. Also, these stacks are made from stainless steel, which helps improve the service life of the oven. Additionally, we offer accessories like a weather cap, a storm collar, and roof flashing. All the above-mentioned features help guarantee the highest levels of precision, and eliminates any chance of under or over-processing. The ACE burn-off ovens are designed to remove substances like varnishes, epoxies, greases, paints, oil, and rubber debris, from machine and automobile parts, as well as other devices. We combine our vast industry experience and technical expertise to develop high heat cleaning burn off ovens. To know more about our ovens, please contact us at the earliest.